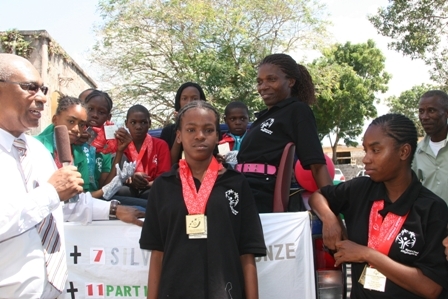 CHARLESTOWN NEVIS (March 02, 2010) — Chants of “Go Special Ed Go” echoed through the streets of Charlestown on Monday, when the students of the Special Education Unit on Nevis, showed off their 11 member medal winning 2010 Latin America Games Special Olympians. 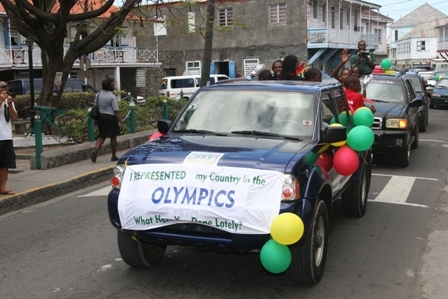 The Special Athletes were part of a motorcade described by Nevis Premier Hon. Joseph Parry as well deserving. 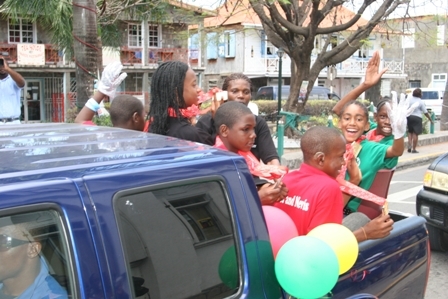 Mr. Parry witnessed the motorcade which stopped briefly outside his Bath Plain Office and used the opportunity to congratulate the students on their achievements. “I am very proud of the performance of these young kids. I have never seen so many gold’s in Nevis. There is a very good reason for celebration. I have to congratulate all those who worked with the kids as well. “We cannot overlook all the efforts made by parents and teachers and I hope this is a platform from which we will launch and reach higher heights. I am very pleased for the kids and for the island,” he said. Meantime, Chairman of the Local Special Olympics Committee Mr. Randolph Boddie told the Department of Information that the students had participated in the Special Olympics Latin American Games as a joint team from the Federation. He explained that out of a total of 17 gold, 15 silver and 9 bronze medals attained by St. Kitts and Nevis, Nevis won 9 gold, 8 silver and 2 bronze medals. The 41 member delegation returned to the Federation at the Robert Bradshaw International Airport on Sunday afternoon. The 11 Nevis Olympians were later greeted on arrival at the Charlestown Pier by Minister of Sport in the Nevis Island Administration Hon. Hensley Daniel, parents, teachers and well wishers.